Purchase this product now and earn 2,498 Points! You are no doubt aware that as you age, your body doesn’t bounce back as quickly as it once did. 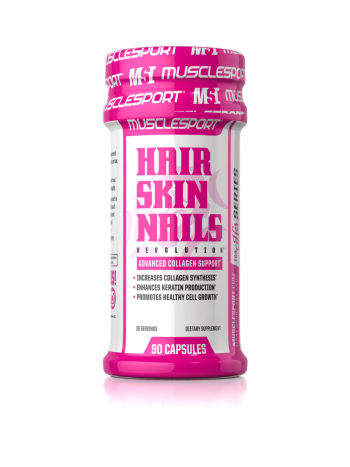 The Musclesport Hair, Skin and Nails formula provides a unique collagen support matrix to help you firm up those key areas. As much as we all hate to admit it outward appearance is important. When we look good we feel good. However; things such as environment, exercise, and activities of daily living often try to sabotage the hard work we put in to look our best. Also, often, these factors take the biggest toll on our hair, skin, and nails. 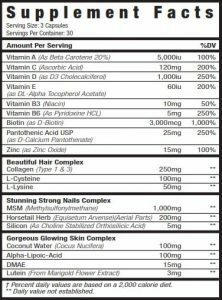 To help combat this abuse MuscleSport developed HAIR, SKIN, & NAILS Revolution…a comprehensive collagen support matrix with key ingredients that help keep you looking your best. 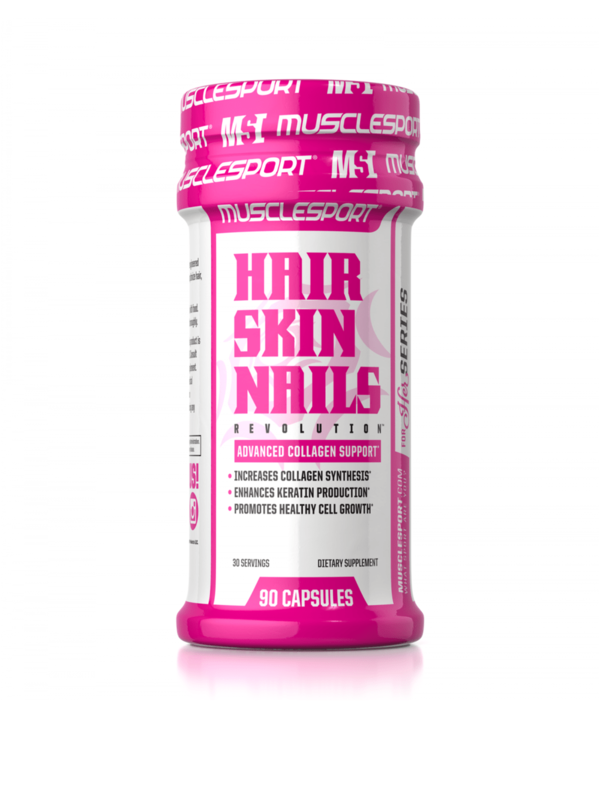 1000mg MSM – MSM provides the sulphur needed to produce collagen and keratin and contributes to the strength and thickness of the hair and nails. 100mg Alpha Lipoic Acid – Helps reverse some of the oxidant damage related effects of ageing. 3mg Lutein – Protects skin from damage caused by the sun’s UV rays and pollutants found in the air. Hair, Skin, & Nails Revolution will help keep the beautiful features you work so hard on while you toil away in the gym and throughout your day. It is the perfect supplement for today’s modern, on the go, woman who cares not only about being healthy but looking healthy as well!